$189 CAN. Comes in various lengths. Steven Huang’s Toronto-based company, Audio Sensibility, is an operation punching far above its price points. There is no pseudo-science being sold here, just sound engineering and first-rate parts and materials. Steven has a B.A. in Chemical Engineering and an M.A. in Mechanical Engineering. His power conditioners, power cables, speaker cables, headphone cables and interconnects have the fit and finish of expensive gear but he sells them at reasonable prices. He also keeps a good stock in hand, so if you order his most popular products, you won’t have to wait for them to be built. Steven’s turnaround time is usually just one or two days; 95% of his orders are shipped within a week. The same cannot be said of every company providing upgrade cables. Steven uses Ohno Continuous Casting copper wire and highly regarded connectors like Furutech. At the SSI Montreal audio show in March 2014, Steven had two identical headphones connected via a router switch to an iPad. One headphone came with its stock cable; the other, with an Audio Sensibility cable. The difference was as clear as night and day. I was sold on the spot. The soundstage opened up, bass was firmer, and everything was clear with less grain. The sound was simply ‘bigger’ in every way. On the basis of this taste test, I asked for his upgrade cable for the HiFiMan HE-400. I took it with me from Montreal and have been using it for almost one month in my office system and I have brought it home a couple times to test the cable on a wide variety of amps and sources. Audio Sensibility upgrade cable for HiFiMan HE-400. 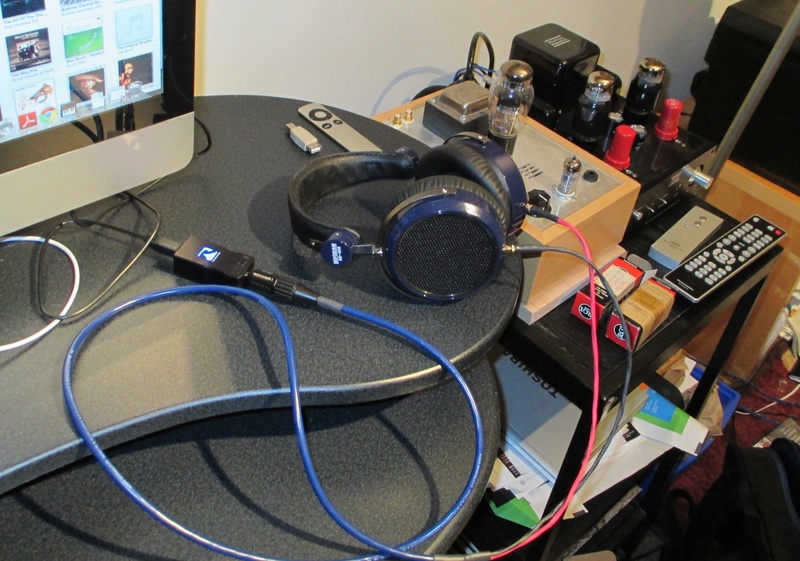 Connected to the amazing Resonessence Labs Herus DAC/headphone amp. Whatever source I hooked my HE-400s to, and no matter the amp, the sound was bigger, richer, fuller, better in every way. Sound is more balanced at low levels. I don’t have to crank the volume pot to get adequate bass. The sound compared with the stock cable is more detailed, more clear, quieter. On “I Am Aglow” (Sarah Harmer, “I’m A Mountain” CD) I can easily discern Harmer’s voice from Julie Fader’s, which can be lost in the background with lesser electronics and cables. The soundstage seems larger. I can now hear the hands of Jason Euringer as they tap his double-bass on “Oleander.” Joey Wright’s mandolin on “I’m a Mountain” finally gets the respect it deserves. At times, with the stock cables, it gets drowned out by the other instruments. The AS cable does a better job than the stock cable in retrieving low-level detail and setting the table of instruments before me. I can see and hear all the performers. I had the same experience with the amazing Fritz Reiner recording of Mussorgsky’s “Pictures at an Exhibition” (RCA Living Stereo SACD). The Audio Sensibility cable allowed me to make more sense of the soundstage. The left-to-right soundstage expanded considerably. Going from the stock cable to the Audio Sensibility cable is like going from a Bottlehead Crack headphone amp to a Decware CSP2+. It reminds me of the difference between the Beyerdynamic DT880s and the T1s. There is more oomph, more power, more drive, a sense of the headphones disappearing. Audio Sensibility’s upgrade cable for the HiFiMan HE-400 is one serious piece of wire; thick, heavy, robust, just like the Furutech connector attached to it. Upgrade cables for other leading headphone manufacturers, from Sennheiser to Beyerdynamic and Audeze, are also available. It makes you wonder why the makers of such wonderful headphones seem content to ship their products with such ordinary cables. I cannot imagine listening to my HiFiMan HE-400s without this Audio Sensibility cable. So I have bought it. Highly recommended.